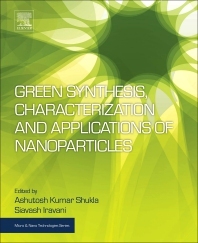 Green Synthesis, Characterization and Applications of Nanoparticles shows how eco-friendly nanoparticles are engineered and used. In particular, metal nanoparticles, metal oxide nanoparticles and other categories of nanoparticles are discussed. The book outlines a range of methodologies and explores the appropriate use of each. Characterization methods include spectroscopic, microscopic and diffraction methods, but magnetic resonance methods are also included as they can be used to understand the mechanism of nanoparticle synthesis using organisms. Applications covered include targeted drug delivery, water purification and hydrogen generation. This is an important research resource for those wishing to learn more about how eco-efficient nanoparticles can best be used. Theoretical details and mathematical derivations are kept to a necessary minimum to suit the need of interdisciplinary audiences and those who may be relatively new to the field. Obtained his B.Sc., M.Sc. and D. Phil. degrees from University of Allahabad, India. During his doctoral work he has focused on the Electron Spin Resonance spectroscopy and optical absorption spectroscopy to study the transition ion doped single crystals. In addition to his exposure to the available CW-ESR spectrometers at leading institutes of his own country he is enriched with hands on experience with modern CW and pulsed ESR spectrometers at several leading International laboratories including University of Dundee, Scotland, University of St. Andrew’s, Scotland and Kazan State University, Kazan. He has successfully completed research projects to his credit in the area of Electron Spin Resonance characterization funded by University Grants Commission, New Delhi, India. He has shared his research in many international events focused on Electron Spin Resonance Spectroscopy, organized in different parts of the globe including U.S.A., U.K., Germany, Spain, Russia. Dr. Shukla has a good number publications to his credit in this filed in peer reviewed journals and books. He also has co-authored a book on “Fundamentals of Electricity and Magnetism” published by New Age International. Dr. Shukla is currently serving as Physics faculty at Ewing Christian College, Allahabad, a constituent institution of University of Allahabad, Allahabad, India.